kris’ good reads expedition: diary entry 2 | Kris + Books = Good. *Sometimes*. … should these shelves relflect the books I own now or should they include books I’ve read and, better yet, have actually remembered what I thought of ’em? If it’s meant to be the former I have some serious editting to do. This entry was posted in good reads, serious randomness. Bookmark the permalink. Okay, I think I have an account on Goodreads, but wow, I'm a bit daunted! Like I don't have a billion things to do already. But someday maybe I will take my inspiration from you and go for it. Let us know when you figure it out! Good luck on your expedition!!!! I've added books that I've read in the past and added my ratings – whether I still own the book or not. I have all the books I have read, which total 1000. Can you imagine me having 1000 books lying around? CJ: Ummm, you're using me as inspiration and to help you decide what to do eventually?? Be it on your head, Mate. Just sayin'. Tracy: Okay. I'm convinced. I will soldier on as I've been doing. KB: Is that a trick question?? 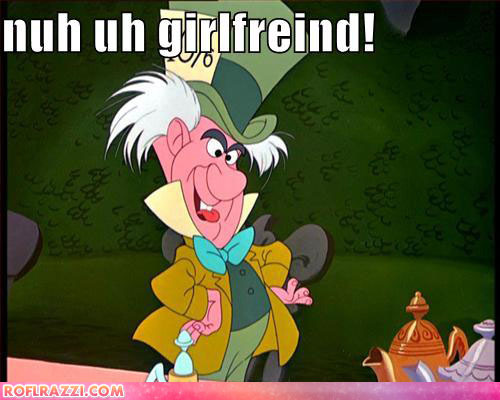 The Mad Hatter is one of my most favorite characters in all of fiction! K Z: *snort* As if you give a toss about the question. Most of the books I've listed so far are books I still have. I did add a few I don't have any longer as I saw them on friends list. Hmmmm. Library Thing lists all the books I've read since January 2008…the thought of putting them all on again… *shakes head* Maybe I might use GoodReads for my 2010 books? I don't know GoodReads at all Kris, but is it possible to separate your books into those read and those to be read? Just a thought 🙂 Good luck! I don't own a lot of books. Most of the books I have read came from the library and they are so many I can't even remember reading them. Lily: I think that's pretty much how I added my read-but-not-haves. Ingrid: I'm using book covers as prompts. Kind of like “Oh, that. Yeah, I read that. It was okay.” thing. Kris, that sounds like an idea but a lot of books I read were in translation and they change the covers most times. Kris, what have you got yourself into? It sounds positively nightmarish! I wouldn't know where to begin. Should I put online my Hardy Boys collection too? And what about all the books I've bought over the years because they were über-cheap but a) I've mostly never read and anyway b) are now falling to pieces? And the books I've read but I don't own. Decisions, decisions! No, all things considered I think I'll stand on the sidelines and see how you fare ;). Ingrid: Tell me about it. At the moment, I'm trawling through Aussie, US and UK covers. It's hellish. orannia – if you have your books catalogued say on a spreadsheet I think you can import them. I'm not that organized so I just did as many books as I could remember when I first got on and now just add as I read. Kris – I'm sure you're doing a fine job. KB – how's that book mattress working out for ya? Tracy: Well, at least one of us is.